Direct mail has declined dramatically with the rise of digital marketing methods. More than 93 billion pieces of direct mail were sent across North America in 2008. By 2014, only 77.9 billion pieces were transmitted across the continent. While online marketing dominates promotional methods, the many benefits of direct mail should lead to modest increases through 2020. However, you don’t have to abandon your digital mail campaigns for modern marketing techniques; you simply need to improve them. Email campaigns sent to incorrect email addresses bounce. When you call an incorrect phone number, you’re told the number has been disconnected or taken over by another household. However, when you have the wrong postal address, you’re unlikely to know the address is incorrect. Ensuring your direct mail reaches your customers is crucial for maximizing your response rate. Take time each year to verify the current addresses for those on your mailing list. Phone calls work best since they provide instant feedback. If a recipient doesn’t answer, send an email. Follow up in a week if you haven’t received a response. Encourage your mailing list recipients to update their contact information when they change addresses. Add an address update feature that users can access through your website. Place the URL on pieces created for your direct mail and email marketing campaigns. Your call to action (CTA) may be the most important part of your direct mail campaign. This statement tells your recipients how you want them to respond and encourages them to do it. A strong CTA can boost your response rate substantially while a weak one can jeopardize your entire campaign. Every communication piece you send your customers should have a purpose. Identify it and your CTA will come naturally. Compelling CTAs are clear and concise. They contain actionable verbs which are impossible to misinterpret. When people read your direct mail letter, they should know what you want them to do. You can ask people outside your marketing department to read your letter and determine whether they understand what’s expected of them. Procrastination prevents action. Limit procrastination by adding a sense of urgency to your CTA. Asking your recipients to call today or claim a free sample by a specific deadline is more powerful than making similar statements without referencing time. The way you present your CTA can make it more compelling. White space draws the eye. Separating your CTA from the body of your letter prevents someone from overlooking it. Using a different color or font size can also help your call to action stand out. Direct mail can help your company cut through the communication clutter. The average American office worker receives 147 emails every day. However, according to the most recent United States Postal Service Household Diary, American households receive an average of slightly more than 18 pieces of mail every week. With such little competition, direct mail already gives your company’s marketing campaign its best opportunity to get noticed. Will you make the most of it? Studies suggest personalization is the key to getting your marketing message over the line. The envelope may be the biggest barrier to disseminating your marketing message. Many direct mail packages end up going into the trash unopened. However, people are 300 percent more likely to open a handwritten envelope than a printed one. This simple act of personalization is an effective one that helps your recipients feel like they’re receiving a letter from a friend rather than a corporation. Adding handwriting to your communications increases that connection. The task may seem overwhelming, but using a service such as Handwrytten can give your direct mail campaigns the handwritten look in an instant. Savvy consumers will see through a handwritten form letter. Make sure you include personal details to strengthen your bond with your recipients. Using names rather than “To whom it may concern” is an important start. But you should look for other opportunities for personalization, too. Mentioning customers’ locations, past purchases, and pop culture references that people of their ages will probably appreciate are other ways you can show your recipients you’re speaking to them. While the text matters, using appropriate imagery can also reinforce your words. For example, a fashion business may use models of different ages wearing clothing designed for different demographics in its direct mail campaigns. Segmenting takes personalization to the next level and ensures your direct mail campaigns reach the most appropriate consumers. Using segmentation, a car company can ensure it sends advertisements about its prestige models to consumers in a high-income bracket rather than those unlikely to splurge on a luxury vehicle. A restaurant chain can alert only consumers in a 20-mile radius about its latest branch opening near them. Segmentation may sound like a complicated process, but modern database management tools make the task easier than you think. Simply identify the characteristics of your target demographic and let your database tool do the rest. Brands build trust when they present consumers with relevant offers. Even if the recipients of your direct mail don’t act on your offer, they can feel as though you understand them as consumers. This powerful insight can help you build long-term loyalty. The most compelling direct mail campaigns contain offers people can’t refuse. Brainstorm strategies to tempt your recipients with your direct mail campaigns. People love feeling they’re receiving something others don’t get. They’ll struggle to resist signing up for your mailing list if you say they’ll receive exclusive members-only coupons. Ordering a product becomes much more enticing if you’ve waiving shipping costs or reducing the price for a limited time. As with all marketing campaigns, the timing of your direct mail campaigns plays a key part in their success or failure. Your direct mail will ideally reach your recipients when they’re receptive to the messages inside them. Getting the timing right isn’t a precise science, but you’ll do best if you put yourself in your customers’ shoes. The members of your mailing list will probably be receptive to a card promoting a great sale sent in the lead-up to Christmas when they’re searching for gift ideas and planning to spend money. Sales announcements can also be received favorably in April when your customers may have extra money from refunds on their tax returns. Your sales efforts are likely to be less effective in January when customers may suffer from a Christmas credit card hangover. Sending direct mail cards through your customers’ journey with your organization is also a great way to engage them and make them feel special. However, timing matters here, too. Send a card saying you have missed a customer’s business too soon and you’ll seem too insincere. However, with the right timing, this type of card can re-engage a lapsed customer and encourage a purchase. On the flip side, a letter thanking a customer for the individual’s business or referring a customer should be sent promptly. If you let too much time elapse, the thank you will seem unnatural. People are becoming more eco-conscious consumers with every passing year. Consumers expect the corporate world to follow suit and adopt sustainable practices. Launching a direct mail campaign can seem at odds with the rising eco-conscious sentiment, but it doesn’t have to be. Show your customers you’re taking steps to make your direct mail campaign eco-friendly and they’ll be much more likely to embrace your efforts. Handwrytten is one company that will happily print your direct mail messages on your own paper. Choose clearly marked recycled paper so that your recipients know you’ve made an eco-conscious choice. You can also choose natural, chemical-free inks. Consider offsetting the carbon footprint required to post your letters and publicizing this key sustainable step. Since households don’t receive many letters, your direct mail is already likely to be more memorable than a marketing email. However, you can increase the chances your recipients will recall your direct mail with a novelty. Think outside the box to create a direct mail campaign that makes a real impression. 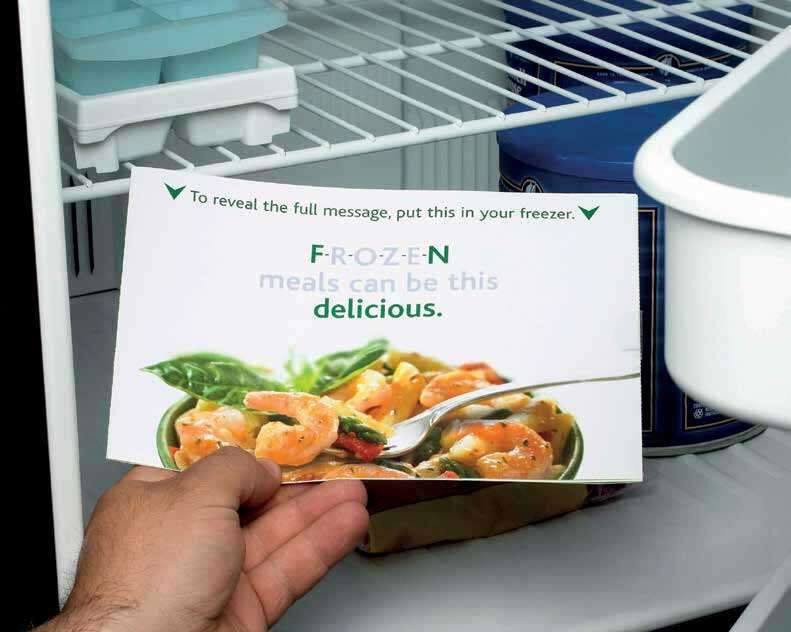 Knorr used leuco dye on a direct mail campaign for a new line of frozen food. The cheeky mailing read “Unlike any F****N dinner you’ve ever tried.” Recipients were encouraged to put the mail in the freezer. The extreme cold triggered a new message reading “FROZEN meals can be this delicious.” The quirky campaign, which had a 10.2 percent response rate, prompted 17,000 purchases. This campaign was so successful that half of the mail was delayed to help supermarkets manage the increased demand for the company’s products. The television program “The Big Bang Theory” promoted itself to Emmy voters with a direct mail item that became a striking 3D pop-up when opened. Other companies have had great success sending playful fake press releases or gifting loyal customers with company merchandise or product samples. The great part about all of these direct mail ideas is that they stay in the minds of recipients long after they open the mail. Even if your recipients don’t take action now, they’re more likely to think about your business when they need your products or services in the future. Brainstorm relevant ways you can also enhance your direct mail materials and make them distinctive. Marketing doesn’t require an either/or approach. Using direct mail doesn’t preclude you from marketing digitally, and vice versa. In fact, the most effective direct mail campaigns integrate with digital marketing campaigns. Research from an InfoTrends “Micro to Mega: Trends in Business Communications” report indicated that print-based marketing campaigns, including direct mail campaigns, achieved response rates of 7.4 percent and action rates of 7.1 percent. While these results were better than the average marketing campaign, they could be improved by integrating a print campaign with marketing efforts on email, social networks, and mobile channels. Think of your direct mail campaigns as one piece in your marketing puzzle. All the pieces should work together to create a bigger picture. They’ll achieve this goal by sharing elements such as imagery, tone, and content. The message should be consistent across all marketing channels. If you’re handwriting your direct mail letters, consider using a similar handwritten font in your digital marketing materials. It’s not uncommon for members of your marketing team to work on different marketing channels. Meeting together regularly to discuss where you’re heading should give your marketing materials the consistency and cohesiveness you’re looking for. Many businesses focus on using direct mail simply for generating sales, but that area is not its only purpose. Direct mail can also increase awareness of your brand and all its offerings. Adding your Instagram and Twitter handles to your direct mail campaigns is an easy way to attract new followers. Even if customers aren’t ready to purchase now, if they start seeing your company appearing on their social network feeds, they’ll be more likely to choose your business in the future. You could also mention your loyalty program, refer-a-friend initiative, or current competition. Don’t miss the opportunity for cross-promoting incentives that help your mailing list members get more value from your business. Integrating digital elements with your direct mail campaigns also makes them more capable of being analyzed. You may wonder whether anyone took action after receiving your handwritten marketing campaigns. Add a personal URL or a Quick Response (QR) code for a special discount or subscriber sale, and you can easily record the responses from individuals who acted on your offer. Track these statistics over time, and you’ll start to see which direct mail campaigns worked and which didn’t. Consider the content and timing of your direct mail campaigns when evaluating their successes. Refine elements that aren’t working to make your future direct mail marketing campaigns better. Rumors of the death of direct mail have been greatly exaggerated. However, as with all marketing strategies, you should seek to continually improve your direct mail campaigns for the best results.